After attaining Enlightenment at the age of thirty five the Buddha delivered his first sermon-Dhamma Chakka Pawathna Sutta to the five ascetics- Kondangna, Vappa, Baddiya, Assaji and Mahanama in the Deer Park at Isipathana near Benares. 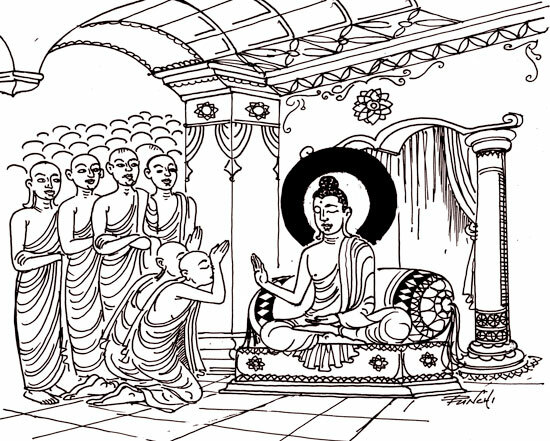 From that day for nearly forty five years, the Buddha continued to preach the Dhamma to all classes of men and women equally- kings and ordinary people, Brahmins and outcasts, the wealthy and beggars, holy men and robbers. Renton De Alwis, the Chairman of the Sri Lanka Tourist Board, says that the shape of Sri Lanka on the map looks like a Green Lung. Just like our lungs are the essence of life, plants and trees are essential for the continuation of human life because they take in Carbon dioxide to grow and sustain. Do men think they are Albert Einstein?